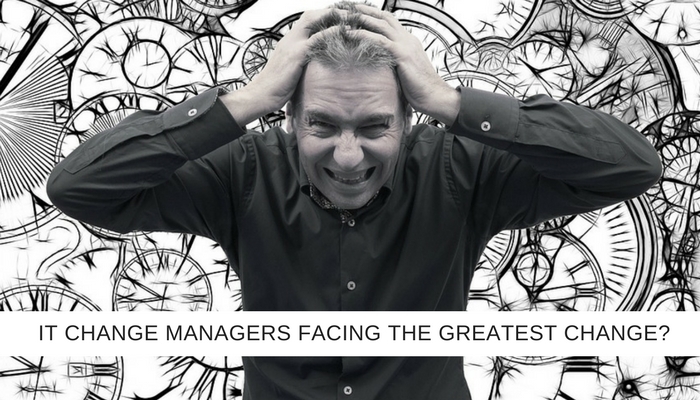 Home / General Discussion / Are the greatest IT Change Managers now facing the greatest change? Now, you may laugh at this, it may not seem like a ground-breaking observation to you. Like many IT environments, my old friend has worked in a space where, for years, each IT project could be successfully delivered with a tried and tested approach – “Waterfall works” might have been their motto! Project after project benefitted from a systematic formula, everyone knew what they were doing, what was expected, how to proceed through the various stages, and time after time projects were delivered successfully. Slowly though, over time, the market changed. Increasingly projects needed alterations during their life cycle to reflect market realities, the business became more IT led and its strategic goals shifted more to an e-commerce model. Then, a complex project appeared that needed an altogether more flexible, more iterative approach. He realised that he and his team had been working in the same way for so long that their skills were no longer aligned with business needs. I found the story interesting because I am hearing many Project Managers say that they feel their role is changing. Actually, last year a PMI conference adopted a theme of “Adapt or Die? Transforming Project Management to Embrace the Challenges of Tomorrow”, with a stated objective of preparing participants “for the significant changes that are already happening, and will exponentially increase, and how this impacts our role as project managers.” The conference, in Norway, focussed on how projects in the future must mirror changing trends and adapt in terms of scope, domain, content and schedule to an ever-faster business changing world. It is clearly deeper than just anecdotal evidence from a handful of my contacts. In Australia, Stephen Callaghan (Agile Transformation Lead, AGL) has noticed similar trends, “There has been much talk about the traditional role of the project manager dying and, from my own experience, the role is disappearing in many of the organizations I’m engaging with. For example, I currently work for a large utility company on a $300m+ transformation programme that used to have dozens of project managers and now we have none at all. That was a transition that happened in less than 12 months,” he told AXELOS (a UK government/private sector joint venture to develop best practice). So, the job title of ‘Project Manager’ appears to be evolving into different roles across businesses and project teams are having to react fast. The rate of change so far, though, is just the tip of a very big iceberg. I don’t know whether the ratio of technology change over the last 30 years compared with the next 30 years will be 1:99, that sounds (paradoxically) both Orwellian and utterly plausible! What I do know though, and there is some comfort in this, is that the Project Management as a Service universe is expanding with solutions at a rate that is keeping pace with the IT project industry finding new challenges. So, however, your business and your IT Project operation evolves, there will be best practice help available.